"Historic is an over-used word" said Jim Bell, Unison full-time officer, "but it really is historic that Doncaster Care UK workers are striking 30 years on from the beginning of the miners' strike. "Then and now, we face the same type of employers, like the miners we have drawn a line in the sand in the face of a profiteer who thinks they can bully us into submission. Give yourselves and the miners of '84 a massive cheer." 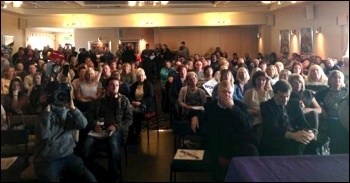 With that the roof came off as 200 strikers and supporters got to their feet at Jim's fitting introduction to the final day rally of an inspiring seven day strike. Around 150 nurses and care-workers for Doncaster's learning disability supported-living service, who were outsourced to the lowest bidder by Doncaster Labour council last September, have been striking against Care UK tearing up the TUPE transfer protection of NHS terms and conditions and axing enhanced payments for unsociable hours, which will lead to around 50% pay cuts! This strike is against the privatisation of the NHS and in defence of the welfare state. What these professional and skilled care workers mean to their service users was explained by Sandra, the 70 year old parent of her mentally-ill daughter. She told the rally that she'd spoken to her daughter on the phone that morning who's asked her "Where's our Carol, Diane, Richard, where's our carers?" "You are part of their lives," said Sandra, "but where are the bosses? Collecting their Mercs or at the bank counting their money. For me, you're not just carers but superstars!" Kirstine Carbutt, a Unison shop steward speaking as a striker, said: "This company doesn't care about us or about the service users - it only cares about this", rubbing her hands together, meaning money. 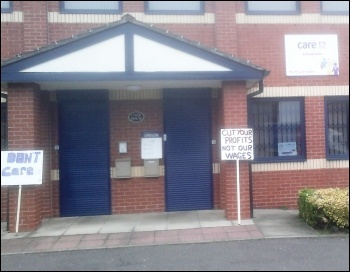 To illustrate that point, a Care UK advert in the local jobcentre was read out, inviting applicants with their own vehicle for £6.73 an hour with no enhancements. Even worse, since the transfer, new staff have been taken on for £6.50/hour, pennies over the minimum wage, and they are on strike as well and got a special mention. 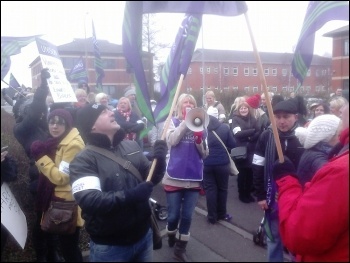 Unison branch secretary Yvonne Butcher and John Cafferty, the union regional secretary, brought full support for the strikers. Daily Mirror columnist Paul Routledge, who wrote a very supportive article last Friday, concluded the top table speeches by saluting the strikers saying: "There's no guarantee of success if you strike, but there is the certainty of failure if you don't have a go." And the strikers then voted to have another go, for another seven day strike as soon as possible. These workers must become a cause celebre for the entire trade union movement. 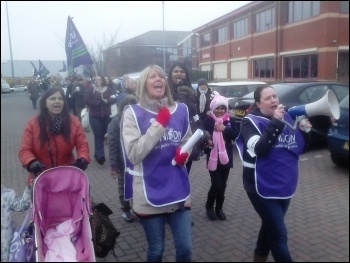 The Mid-Yorkshire NHS Unison branch, which took nine days of strike action last year against down-banding, has already donated £1,000 and a Doncaster Unite branch another £1,000. The 20,000 strong "30th anniversary of the miners strike" Facebook page is publicising for support. Send messages of support to admin@unison-dab.org.uk and send donations/cheques, made out to "Doncaster, District & Bassetlaw Health Branch", to Jenkinson House, White Rose Way, Doncaster DN4 5GJ. This version of this article was first posted on the Socialist Party website on 6 March 2014 and may vary slightly from the version subsequently printed in The Socialist.